A fiendish killer lurks at the opera! Weird! Thrilling! Clocking in at a mere 65 minutes, this fast-paced mystery was well received by audiences upon its release, and has gone on to become one of the favourites of the Charlie Chan film series. 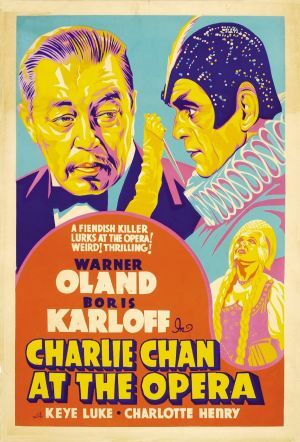 It's helped in no small way by the presence of not only Warner Oland as Chan and Keye Luke as Number One Son, but a terrific supporting turn from Boris Karloff, here appearing as Gravelle, an embittered opera star who has been imprisoned for seven years in an asylum. It's here that the story begins, with the mysterious inmate filling the air of the asylum with mournful music, like some demented callback to The Phantom of The Opera. When a guard happens to reveal, by means of a newspaper's front page, that the famous prima donna Lilli Rochelle has returned to Los Angeles after a seven year absence, something jars Gravelle into normality. Or is that abnormality? Moments later, he has broken free, and a citywide manhunt is put into operation. Meanwhile, Chan, who has just finished aiding the police with a case is asked by Lilli Rochelle, an old friend, to investigate a death threat she has received. Along with Number One Son, Chan is soon embroiled in a web of murder, adultery and family secrets, set against the backdrop of an operatic performance. If you've never seen a Charlie Chan film before, this may be the best starting point. It contains the usual ingredients: murder, a whole hatful of suspects, red herrings and words of Eastern wisdom from Charlie whenever the opportunity permits. What elevates this film above most of the others though, is the quality of the mystery, which takes some genuinely surprising turns. It's unclear, for a short while, in which way the story is going to play out. Seasoned thriller fans may be able to spot a red herring from sixty feet, but here they're an altogether less bright colour. Oland is uniformly excellent. Warm, wise and a benevolent guide through the film, it's a wonderful performance from a gifted actor who had, by this time, made the character his own. This may not be the Chan of the books, but Oland's portrayal is certainly the definitive Chan of the screen. This was his thirteenth outing as the Honolulu detective, and sadly he was to die only two years later, to be replaced by Sidney Toler in the role; an altogether different, more antagonistic Chan. Karloff, as always, is delightful to watch. As the wild-haired Gravelle, he appears far too infrequently, leering through door-cracks and creeping among the shadows. He was at the height of his fame in 1936, and it's a testament to his character that he took second billing here in this, a supporting role, when he could quite easily have demanded top billing and more screen time. Karloff always brought a superior quality to a film, whether he was playing it straight, dressed in bandages or sported bolts through his neck. 1936 was the mid-point of his 'mad scientist' roles. He'd recently come off the back of 'The Invisible Ray', 'Juggernaut' and 'The Man Who Changed His Mind', and in all his films seemed contractually obliged to utter the line "But I must be given time to finish my experiments" in his distinctive lisp, before spending the rest of the film dispatching his enemies. Here his character is more opaque, extra-dimensional, with secrets of his own. Karloff is perfect in scenes that require the hidden pain of Gravelle to find voice. It's unfortunate then, that with such strong support, Keye Luke doesn't have much to do here except his recurring trope of evading the authorities by hiding in cupboards for the entire running length of the picture. Here, he disguises himself as part of the opera company, whilst being chased by dumb flatfoots. It's an amusing respite from time to time, but doesn't add anything to the story. William Demarest appears in a minor role as Sergeant Kelly, on the side of the law, but initially incensed by Chan's presence in the case. The Chan series is often accused of racism, and I guess that if you're easily offended, you may take against the fact that Kelly refers to Chan as "Chop Suey" a few times. Personally, I never found the series to be inherently racist. Sure, certain less progressive characters do appear from time to time to insult Chan, or other foreigners to their lands, but they are almost always swatted away as insignificant, roundly trounced verbally by Chan himself, or show remorse and respect for him by the end of the film. It's no different here. In fact, Charlie Chan and his extended family are for the most, often shown the greatest of respect by all characters. He is a cultured, intelligent, well-mannered and wise family man, a far cry from the snivelling "yellow peril" of contemporary pulp fiction that Earl Derr Biggers was rallying against when he created the character. There are a couple of small niggles, such as the age of Lilli's daughter. By the movie's reckoning, she should be eleven years old, yet she wonders why her mother might have objections to her being married? Also, Keye Luke is completely wasted, running from dressing room to dressing room shouting "Pop" every few minutes. It's a shame they couldn't find more for him to do. These small points don't hinder the movie in any great way though. 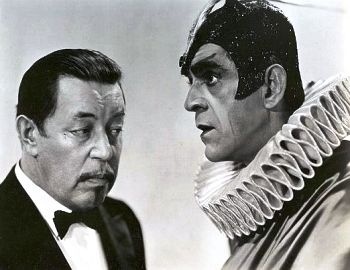 'Charlie Chan At The Opera' is a solid, witty mystery with little gristle, that'll keep you guessing until the end, which is only sixty five minutes away from its (literal) overture.